Look for Shiraz Persian Foods and Spices on Oakland Ave. between the Subway shop and Trattoria restaurant, but look carefully — if you blink you could miss it. Don’t let size fool you, though. The little store’s shelves are stocked with all the ingredients that cooks need to please a Persian’s palate or anyone’s taste that appreciates good curries, hummus, and aromatic teas. Five years ago Ehsan Edalatpour came here from Iran to visit his brother. After a year, he wanted to go back to his homeland, but his son had come with him and told his father, “You go, I’ll stay.” Not wanting to leave him, Ehsan decided to make a life here in Milwaukee. 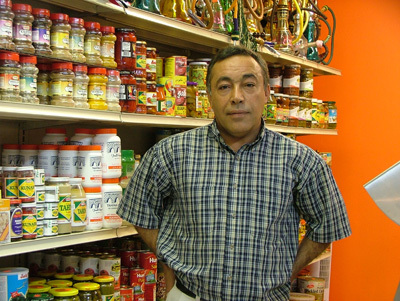 In addition to his Persian grocery at 2864 N. Oakland, he and his brother own Shiraz Restaurant at 6030 W. North Ave. in Wauwatosa. The two establishments work hand in hand to offer customers an impressive selection of Persian food. “People come to the restaurant, they like the spices, the tea, and we tell them to come here [the grocery] and shop,” Ehsan explained. Likewise, “they come here and they want to try Persian food. We give them the address of the restaurant.” He also sells cookbooks at the grocery for cooks wanting to try Persian dishes at home. Others who prefer to skip the cooking and go right to the eating can choose from a wide selection of prepared foods in cans and jars. “Just warm it up,” Ehsan explains. “Curries, so popular in my country of Iran, are very good ready food.” Vegetarian curries, like mixed vegetable, or pomegranate and walnut, make a complete meal with rice or bread and a dollop of torshi, a vegetable relish aged in vinegar. Aromatic tea with date-filled butter cookies can make a delicious dessert or snack. “We have eight different kinds of bread, all from Iran,” says Ehsan. He recommends toasting some of the bread to serve with cheese — goat, sheep or Bavarian, among others. To cook with the staples — rice, beans, lentils, nuts, flours, olive oil — Ehsan carries a good selection of Persian and Arabic spices. And of course, there are figs and dates, both fresh and dried. Did you ever eat a fresh date? The store is open 11-9 Mon.-Sat. and 12-6 on Sundays. Hot deli items and two kinds of Persian sandwiches are offered daily.